2 1/4" U.S.A.F. Warbird Jet Gear Box Oil Pressure Indicator. Manufactured by Bendix. P/N 6801-A10B-92-A1. Very clean item. It shows very well and it would make an excellent show piece for the bookshelf in the office or home or just as a mock up panel item. 2 1/4" U.S.A.F. Warbird Jet Gear Box Oil Pressure Indicator. Manufactured by Bendix. P/N 6801-A10B-92-A1. Very clean item. It shows very well and it would make an excellent show piece for the bookshelf in the office or home or just as a mock up panel item. Do you happen to know..
2" U.S.A.F. Warbird Jet Fuel Pressure Indicator. Manufactured by Pioneer. Type AE-344-1-A. Very clean item. It shows very well and it would make an excellent show piece for the bookshelf in the office or home or just as a mock up panel item. 2" U.S.A.F. Warbird Jet Fuel Pressure Indicator. Manufactured by Pioneer. Type AE-344-1-A. Very clean item. It shows very well and it would make an excellent show piece for the bookshelf in the office or home or just as a mock up panel item. Do you happen to know the type of ai..
3 1/8" U.S.A.F. 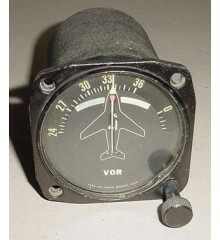 Warbird Jet Mach Number Indicator. Manufactured by The Hickok Electrical Company. P/N 564-817. Very clean indicator. Back cover is missing. It shows very well and it would make an excellent show piece for the bookshelf in the office or home or just as a mock up panel item. 3 1/8" U.S.A.F. 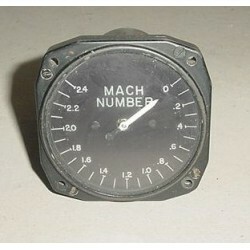 Warbird Jet Mach Number Indicator. Manufactured by The Hickok Electrical Company. P/N 564-817. Very clean indicator. Back cover is missing. It shows very well and it would make an excellent show piece for the bookshelf in the office or home or just as a mock up p..
Vintage 3 1/8" Vietnam War Warbird Aircraft Drift Angle / Ground Speed Indicator as shown on photo. P/N ID-938A/APN-147. Used with the AN/APN-147 series navigation systems. NSN 5841-00-892-1070. It would make an excellent show item of the office or home or as a mock up panel ..
Vietnam War Vintage Warbird Aircraft Pilot / Copilot / Aircrew Headset as shown on photos. Manufactured by Astrocom. It appears to be in good condition but I am unable to test it. Sold for display only, as is, no returns. 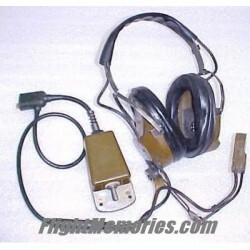 Vietnam War Vintage Warbird Aircraft Pilot / Copilot / Aircrew Headset as shown on photos. Manufactured by Astrocom. It appears to be in good condition but I am unable to test it. Sold for display only, as is, no returns. ..